I tend to set this simple-looking question for coursework in policy modules: what is policy, how much has it changed, and why? Students get to choose the policy issue, timeframe (and sometimes the political system), and relevant explanatory concepts. On the face of it, it looks super-simple: A+ for everyone! I try to encourage some creativity when solving this problem, but also advise students to keep their discussion as simple and jargon-free as possible (often by stretching an analogy with diving, in which a well-executed simple essay can score higher than a belly-flopped hard essay). 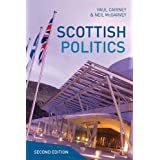 Describe the nature of policy, and the extent of policy change, in a particular time period (such as in the post-war era, since UK devolution, or since a change in government). Select one or more policy concept or theory to help structure your discussion and help explain how and why policy has changed. For example, a question might be: What is tobacco policy in the UK, how much has it changed since the 1980s, and why? I use this example because I try to answer that – UK and global – question myself, even though my 2007 article on the UK is too theory-packed to be a good model for an undergraduate essay. 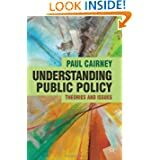 You may be surprised about how difficult it is to answer a simple question like ‘what is policy?’ and I will give you considerable credit for considering how to define and measure it, by identifying, for example, the use of legislation/ regulation, funding, staff, and ‘nodality’ and/ or by considering the difference between, say, policy as a statement of intent or a long term outcome. In turn, a good description and explanation of policy change is difficult. If you are feeling ambitious, you can go further, to compare, say, two issues (such as tobacco and alcohol) or places (such UK Government policy and the policy of another country), but sometimes a simple and narrow discussion can be as, or more, effective. Similarly, you can use many theories or concepts to aid explanation, but often one theory will do. Note that (a) your description of your research question, and your essay structure, is more important than (b) your decision on what topic to focus or concepts to use. The wider aim is to encourage students to think about the relationship between different perspectives on policy theory and analysis. For example, in a blog and policy analysis paper they try to generate attention to a policy problem and advocate a solution. Then, they draw on policy theories and concepts to reflect on their papers, highlighting (say): the need to identify the most important audience; the importance of framing issues with a mixture of evidence and emotional appeals; and, the need to present ‘feasible’ solutions. The reflection can provide a useful segue to the essay, since we’re already identifying important policy problems, advocating change, reflecting on how best to encourage it – such as by presenting modest objectives – and then, in the essay, trying to explain (say) why governments have not taken that advice in the past. Their interest in the policy issue can prompt interest in researching the issue further; their knowledge of the issue and the policy process can help them develop politically-aware policy analysis. All going well, it produces a virtuous circle. Let me outline how I would begin to answer the three questions with reference to UK tobacco policy. I’m offering a brief summary of each section rather than presenting a full essay with more detail (partly to hold on to that idea of creativity – I don’t want students to use this description as a blueprint). What is modern UK tobacco policy? Tobacco policy in the UK is now one of the most restrictive in the world. The UK government has introduced a large number of policy instruments to encourage a major reduction of smoking in the population. They include: legislation to ban smoking in public places; legislation to limit tobacco advertising, promotion, and sponsorship; high taxes on tobacco products; unequivocal health education; regulations on tobacco ingredients; significant spending on customs and enforcement measures; and, plain packaging measures. [Note that I selected only a few key measures to define policy. A fuller analysis might expand on why I chose them and why they are so important]. How much has policy changed since the 1980s? Policy has changed radically since the post-war period, and most policy change began from the 1980s, but it was not until the 2000s onwards that the UK cemented its place as one of the most restrictive countries. The shift from the 1980s relates strongly to the replacement of voluntary agreements and limited measures with limited enforcement with legislative measures and stronger enforcement. The legislation to ban tobacco advertising, passed in 2002, replaced limited bans combined with voluntary agreements to (for example) keep billboards a certain distance from schools. The legislation to ban smoking in public places, passed in 2006 (2005 in Scotland), replaced voluntary measures which allowed smoking in most pubs and restaurants. Plain packaging measures, combined with large and graphic health warnings, replace branded packets which once had no warnings. Health education warnings have gone from stating the facts and inviting smokers to decide, and the promotion of harm reduction (smoke ‘low tar’), to an unequivocal message on the harms of smoking and passive smoking. This is the section of the essay in which we have to make a judgement about the type of explanation: should you choose one or many concepts; if many, do you focus on their competing or complementary insights; should you provide an extensive discussion of your chosen theory? I normally recommend a very small number of concepts or simple discussion, largely because there is only so much you can say in an essay of 2-3000 words. For example, a simple ‘hook’ is to ask if the main driver was the scientific evidence: did policy change as the evidence on smoking (and then passive smoking) related harm became more apparent? Is it a good case of ‘evidence based policymaking’? The answer may then note that policy change seemed to be 20-30 years behind the evidence [although I’d have to explain that statement in more depth] and set out the conditions in which this driver would have an effect. In short, one might identify the need for a ‘policy environment’, shaped by policymakers, and conducive to a strong policy response based on the evidence of harm and a political choice to restrict tobacco use. 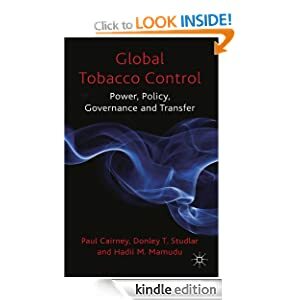 It would relate to decisions by policymakers to: frame tobacco as a public health epidemic requiring a major government response (rather than primarily as an economic good or issue of civil liberties); place health departments or organisations at the heart of policy development; form networks with medical and public health groups at the expense of tobacco companies; and respond to greater public support for control, reduced smoking prevalence, and the diminishing economic value of tobacco. This discussion can proceed conceptually, in a relatively straightforward way, or with the further aid of policy theories which ask further questions and help structure the answers. For example, one might draw on punctuated equilibrium theory to help describe and explain shifts of public/media/ policymaker attention to tobacco, from low and positive in the 1950s to high and negative from the 1980s. Or, one might draw on the ACF to explain how pro-tobacco coalitions helped slow down policy change by interpreting new scientific evidence though the ‘lens’ of well-established beliefs or approaches (examples from the 1950s include filter tips, low tar brands, and ventilation as alternatives to greater restrictions on smoking). One might even draw on multiple streams analysis to identify a ‘window of opportunity for change (as I did when examining the adoption of bans on smoking in public places). Any of these approaches will do, as long as you describe and justify your choice well. One cannot explain everything, so it may be better to try to explain one thing well. Tagged as Policy, policy analysis, policy change, policy essay, Policy studies, Politics, tobacco policy, UK policy, UK politics and policy, what is policy?